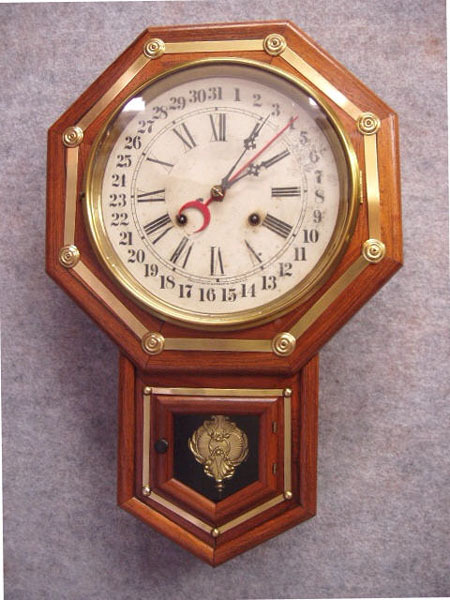 Waterbury 10" "Yeddo" Drop Octagon Wall Clock. Circa 1890-1900. The Case Is Rosewood Veneered With Brass Trimmings. The Dial Is Painted With Roman Numerals And Arabic Numbers For The Calendar. The 8 Day Springwound Movement Is Time, Strike And Calendar. Height 22" X W. 14" X D. 5"